Save time and money with the Fives Diagnostic Communication System (DCS) which allows Fives technicians to diagnose machine errors and issues remotely. The system is standard on all new Cincinnati and Giddings & Lewis machine tools and available on installed machines with PC-based HMI. 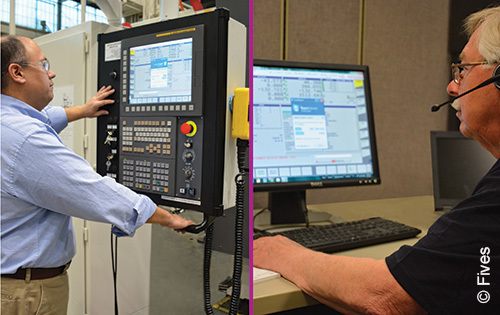 Using a commerically-based software package, TeamViewer, to connect to the machine tool, the Fives Diagnostic Communication System (DCS) is secure and fast. Connection between the control and the service technician passes through a VPN (Virtual Private Network). A new and unique password is generated by TeamView each time DCS is activated. The program only runs when an operator asks for service. An activity log is created and records the machine issues and the name of the operator.